Moving an office space is a bit complicated and time-consuming. It requires an intensive planning, packing, storing and even moving of item from one place to another. Yes, it is quite complex. Yet, you can make it somewhat less hassle and stress-free. Ask how? We’ll all you need to do is to consider this office removalist Sydney hacks in labelling your Boxes. Yes, labelling your boxes when you’re relocating your office can make your transfer easy and hassle-free. How could that happen? Well, labelling your items helps you organise things as easy as possible. And it even eliminates the stress associated with figuring out if all boxes arrived at its destination. Here at Business Relocation Services, we understand your sentiments. And we want to help you out. That is why our Office removalists Sydney team gives you these 4 useful hacks that could help you in properly labelling your boxes as you do the business relocation. Before you can put labels into your boxes and organize them accordingly, you need to have the right tools. What specific tools? Well, a toolkit which contains markers with more or less all the primary colour. That you can use as you mark your boxes. Yes, you hear it right, if possible use a permanent marker. So that labels are visible and hard to erase. As you pack your items in each corresponding box, you should mark the boxes with different colours. Which simply means that you shouldn’t only use black markers. Buy one of every colour if possible. And instead of buying the cheapest marker, make sure that they are of high quality. The marker you need to buy should be permanent and waterproof to make sure that nothing ends up erasing what you write. Note that labels should make it easy for you to identify your boxes when moving. In addition, you may also use coloured tape. As this will help you organise your boxes in terms of colour which improves your labelling system a great deal. You should implement colour code for every box so you could instantly recognise which box contains what from your items. We recommend you assign a colour to each room. And then mark those boxes with the same colour assigned on that room. This very simple yet an efficient system could save you a great time. By this simple way of proper organisation, you could ask removalist team to stack and unload your boxes to its corresponding room accordingly. This will make the unpacking a lot easier. Make sure to provide the office removalists Sydney company you hire a copy of the list of colours and the room that each box needs to store. In this way, there is no need to monitor frequently the unloading process. If you’re dealing with many boxes, then a colour code labelling system may not work efficiently. So instead of using a colour box code, you could use numbers. Yes, labelling your boxes with numbers make your move more organised. And you’re not limited to the number of colours. Plus, you don’t have to use a similar colour which might confuse the office removalists Sydney team you hired. Thus, you could also record the number and the content for each box. Which may help you in unpacking your items more manageable once it arrives at its destination. You could provide this list of corresponding numbers together with the room it is meant to transfer for easy unpacking process. And if you plan to store some of these items in a Self Storage, then you can easily locate which number is stored and which item is transferred for relocation. If you have lots of small items in the box, making a list of what it contains would be a good idea. This will help when you unpack your items. The other thing you also need to keep in mind when you do relocation is to used not at least 2 sizes of box. Doing this will make the loading easier. And also, an office removalists Sydney expert should know that when loading the boxes into the truck the labels should face front and not the other way. This will ensure that you can easily see which boxes are unloaded as you arrive at your new location. 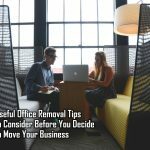 As professional office removalists Sydney team with full experience, we collect many useful hacks to ensure that our client is highly satisfied with the services we offer. Labelling is just one of the many methods we suggest you do for an effective and hassle-free office relocation. Did you find these Office Removalist Sydney Hacks useful? Business relocation services can give you more useful tips about office removalists. Or you may visit our blog section for more insights and ideas. Do you wonder what qualities you should look for in an office relocation expert? Read our post on the qualities of a good office relocation expert today!